Here are summary notes from the BNC’s January board meeting and operations. Thanks for supporting the BNC! Looks like it’s time to organize some BNC race suits and maybe jackets after a hiatus from BNC clothing. Details to follow in February or March. Officers have not been elected and that’s because two board meetings in a row the current officers have had things like family in the E.R. result in their absence. Good thing that things don’t happen fast around the BNC anyways. The Anne Gini Elite Skier Fund provided nearly $5000(!) to Kelsey Phinney who skied on the World Cup with the US National Team through December. The board is currently deliberating the proper way to perpetuate the fund. Finances are healthy despite another low snow year in town. 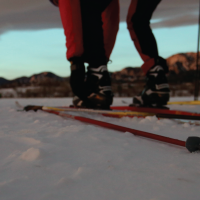 The Season Opener event at Snow Mountain Ranch in partnership with SMR and Boulder Nordic Sport went well and the BNC plans to continue or expand its support for the event in the future. Community Ski Days are working out thanks to Henry Gibb stepping in and taking more load from board member Chris Sachs who has found himself in the middle of the full catastrophe (life, kids, job, school, house, etc.). The BNC is finally executing its demonstration groom at West Mag in typical West Mag conditions–snow, wind, rocks, snow… The jury is still out on this work. Have a great rest of the season! 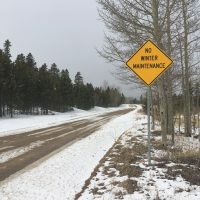 Thanks to The Boulder Ranger District And NATO!